Book 4 in Love of Cooking: Volume I. When it is cold outside it is time for soup. Fall is coming upon us & that means warm meals. They are great when you feel bad & they are a treat when you feel well. The recipes are so easy to follow & delicious that anyone from the novice to pro will enjoy fixing & especially eating them. This is one of my favorite cookbooks. The variety of side dishes will surprise you. A few favorits from this book are the Lima Bean Casserole, Sesame Brussels Sprouts & Garlicy Cheese Grits. I love so many of them that it is hard to chose even a few favorites. You will never have to struggle with what to serve with your main coarse again. Love of Cooking: Salads is a wonderful collection of all types of salads. Dinner salads, fruit salads, fresh veggies salads & more. There is something for every taste. There are full meal salads as well as a section of dressings. You will love this book for the spring & summer, but I’ll bet you use it all year. Love of Cooking: Appetizers is filled with delicious starters for any party. From the huge selection of dips to the perfect 1st coarse at your dinner party. You will always find the something to bring to a party or make your party special. This is available on kindle by itself or 0n kindle & in paperback in LoC: Volume I.Enjoy! Make your Last Blast of Summer a real Blast! Use recipes from Love of Cooking: Labor Day to make your party or cookout a hit! From appetizers to desserts, there is something for everyone! Make your Last Blast of Summer a real Blast! 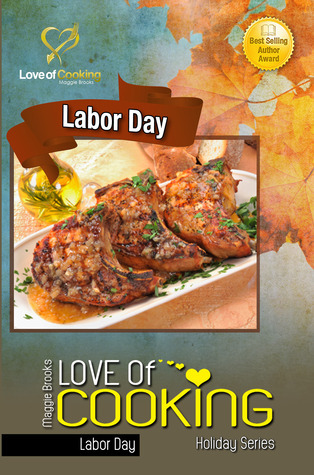 Use recipes from Love of Cooking: Labor Day to make your party or cookout a hit! From appetizers to desserts, there is something for every taste. If you need to bring a dish to share or the party is at your house, you will be glad that you have this book to draw from. LoC: Labor Day is for the holiday or Any Day! Enjoy! This is quoted from the US Dept of Labor. After those first union workers proposed a day to recognize all workers, we seem to just have our last long weekend of the summer that many use to gather with friends & family. How ever you choose to honor the American Worker, food is almost assuredly a part of the celebration. I hope that my Labor Day book becomes a go to cookbook for Labor Day Weekend & that everyone uses it all year long as well. Last Blast of Summer: Recipes You Will Love All Year! For Labor Day or Any Day!